Just In! Give Thanks to Up Engagement and Retention - Take Charge Inc. The time of year is fast approaching when we in the States officially take a day off to reflect and give thanks – something that is easy to overlook in the hustle and bustle of everyday life. The same holds true in organizations where the impact of gratitude and recognition is just as significant. According to a recent study by Office Team, 66% of employees report they would likely leave their jobs if they didn’t feel appreciated (a whopping 76% of millennials reported the same!). A positive and recognition-based culture remains elusive for many. Although the concept of culture has been around for decades, it stills captures headlines in articles from Forbes, the Harvard Business Review, and other revered management tomes with titles such as “How to Build a Positive Company Culture” and “The Culture Factor.” While culture building and changing are long term propositions, some pretty basic practices can start to pa e the way. Implement this simple three-prong strategy to up the gratitude in your organization. 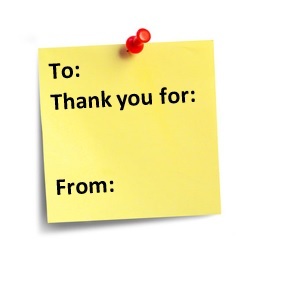 At the macro level: Consider a “Wall of Thanks” – an impromptu place where people can publicly acknowledge others by completing a post-it. We watched a client do this years ago. It went from one Director using a couple of walls in a hallway – to the entire organization using mega walls placed in the HQ foyer. Ensure your managers have the skills to recognize and praise those who do good work day in and day out. Provide this job aid – and a challenge – to recognize and thank at least 5 people a day between now and the end of the year for the good work that they do. Keep yourself centered and thankful with a daily gratitude practice. Identify and/or reflect on a few things each day for which you are thankful. Ongoing practice has been shown to significantly shift your relationship to, and satisfaction associated with, work. And, to continue the theme of thankfulness…Thank you, our extended tribe, for trusting us with the development of your leaders. Click here for an e-book of 52 Leadership Quotes To Inspire You To Greatness.